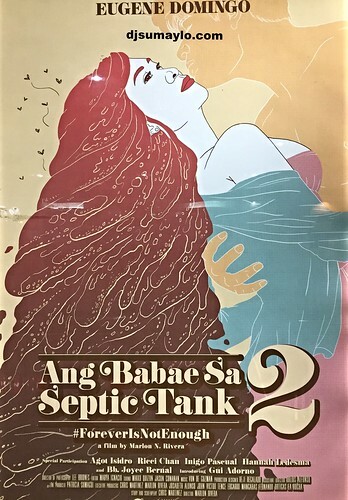 One of the first MMFF 2016 entries I watched was Ang Babae sa Septic Tank Part 2: Forever’s Not Enough for two basic reasons – the first one was a personal favorite so watching part two is a requirement and there were a few people getting in line for this movie which is sad. This year’s full length films also feature entries for the short film category. Each short film is paired with a full length film that somehow carries the same theme. Septic Tank was paired with the short film “Manila Scream” by Roque Lee and Blair Camilo inspired by an 1893 painting “The Scream” of Edvard Munch. Personally, it was one of those short films that is trying too hard to be a social commentary “screaming” at social issues including air pollution and poverty and just like the painting, a commentary of the self and its environment. To include this as Septic Tank’s tandem was weird for me. The film did not come across as comedy for me. Borrowing Chris Martinez’s line in his play “Last Order sa Penguin”, this short film is too pa-deep.